Today I've mostly stayed in my room. 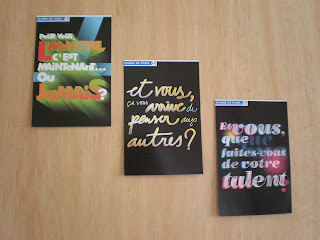 It seems like the strike finally is about to end, so I decided to do some reading for the courses I have here in Paris! Then I also played some piano and talked a bit about a guy living a few rooms away from me. 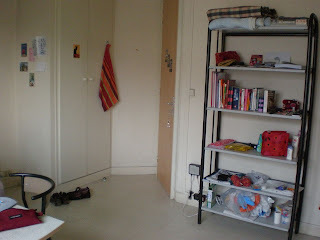 He stoped me in the corridor and asked if I'm the new person living in room 649 and then asked if I'd mind to talk just a few minutes to get to know one another better. And even though I thought it was strange and suspicious that someone wanted to talk with a total stranger, I stayed for a little while. I guess I'm getting used to this strange kindness and interest here in France. 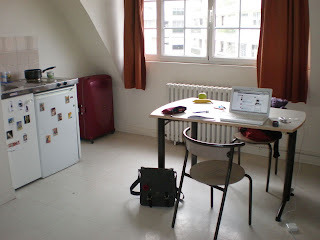 Anyway, since I've spent so much time in this room today, I thought it's finally time to show you some pictures from where I live at the moment. And since a picture says more than a thousand words, here we go! 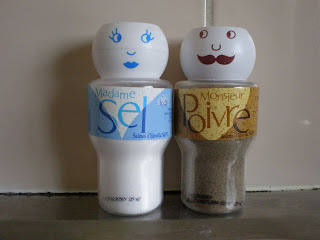 Mrs Salt and Mr Pepper, who's flirting with each other every day. Who knows where this will end? 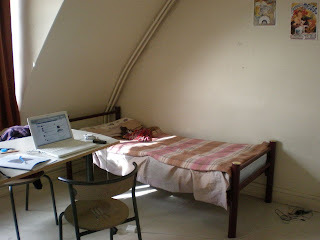 And here's the view when I enter my room. My table underneath the window with the horrible curtains! The colour is almost ok when the sun is shining like in the picture, but in the evenings they're just ugly... And yeah, my computer is of course the centre of the room :D There I do everyting. 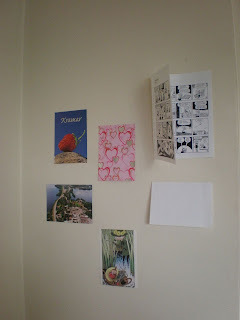 Study, listen to music, look at my photos, chat with my friends. Yeah... so this is my home at the moment. 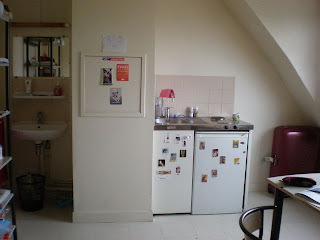 Quite big actually if I compare it to for example the one-room flats of Sophie or Liss! And I've really tried to make it cosy, but on the other hand, it's only for five months (or less than tree months left now) so it feels on the same time a bit unnecessary to put down too much effort on it.